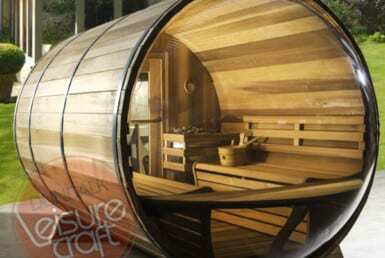 Don’t let the simple design deceive you, outdoor barrel saunas have some surprising perks. 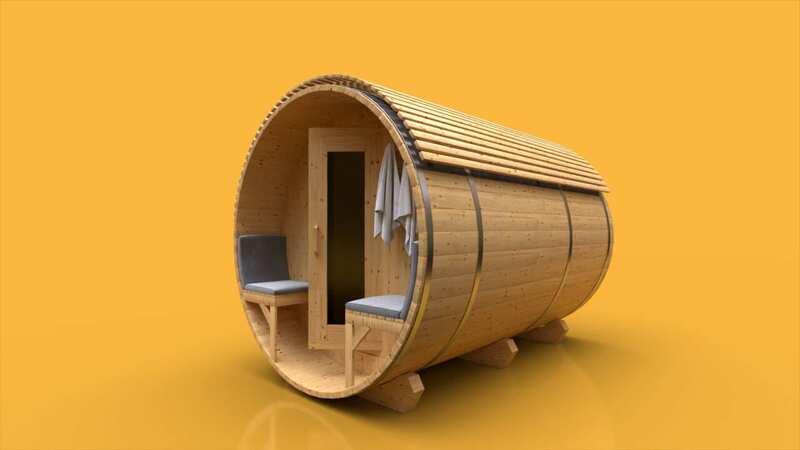 A barrel sauna, or Tynnyrisauna, is a minimalist, cozy sauna that looks great anywhere. They are assembled with two circular walls and staves made out of tongue and groove 2×6’s and strapped together. They are used habitually by people who seem to have superpowers – like Twitter founder Jack Dorsey, author Tim Ferris, and world record holder Wim Hof. Because they use a single layer of wood that acts as the interior and exterior surface, they don’t have much insulation to keep the heat in and the cold out. The barrel sauna overcomes the lack of insulation by efficient use of space and convection to rapidly and evenly heat up. 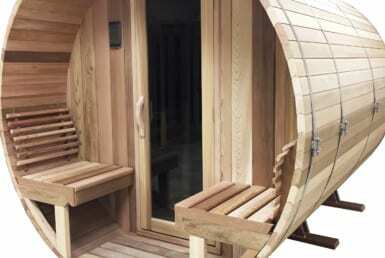 First, a barrel sauna has 23% less space to heat than a cabin style sauna of the same size. This is a huge advantage and goes a long ways to compensating for its lack of insulation, but that’s only part of it. The signature circular design keeps heat from settling at the top of the barrel. The hottest air inside is constantly being created at the heat source (either wood stove or electric heater), and due to convection, the hot air rises to the top. The less dense air at the top of the sauna circulates back to the bottom where it becomes hot again. The circular design of a barrel sauna means that the hottest air is constantly in motion, resulting in a steady, efficient heat throughout the interior space. The wood expands as it heats up, creating a better seal to keep moisture and hot air from escaping through the staves. No foundation required! Just put the cradles on some pavers, blocks, deck, or concrete pad. Because the single layer of (usually) cedar is the only insulation, it’s important for those in cold climates to compare thickness of wood, as it will make a big difference. Look for at least 1″ wood staves for cold climates. 1.5″ and 5/4 (1 1/4″) thick. Standard 2×6’s are perfect, and will give you an 1 1/2″ staves. Luckily, the low density of softwoods like Western Red Cedar mean they are better at insulating your sauna than hardwoods. The r-value of Western Red Cedar is approximately 1.41/inch. This is better than hardwoods, at around .71/inch, but very low compared to a traditional sauna build with insulation in the walls (around R-13+). 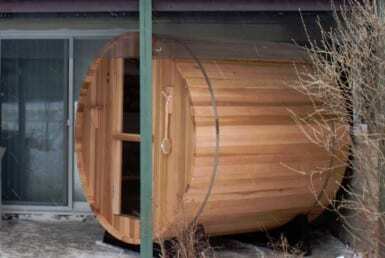 The barrel sauna itself has very little thermal mass. Make sure to add plenty of rocks near the heat source, under the floor boards, or anywhere else you can squeeze them. Water also makes excellent thermal mass but it can freeze. Thermal mass slows down the heating process but makes a more steady heat that lasts longer and doesn’t loose heat as fast when the door opens. Also, because the temperature difference can be so extreme between inside and outside, you will probably want to oversize your heater or sauna furnace to make sure you can reach your desired temperature, especially in colder climates or with thinner cedar planks. We consider the uniform heat as a positive, but having a barrel sauna does exclude the option of sitting on the top bench, where it’s warmer and more humid. Some people have different heat and humidity preferences and the double bench design of many cabin style saunas allows the choice. 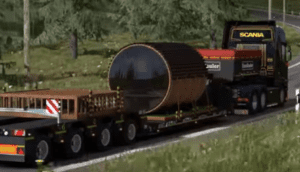 Put some wheels (or floats) on it! 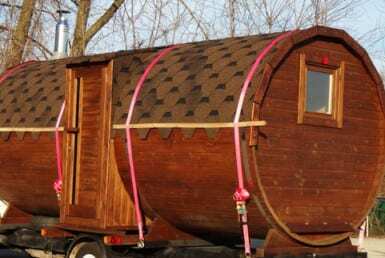 Another perk of the barrel sauna is that it can easily become a mobile sauna, or be transported to your cabin, hunting spot, or even be loaded on a boat, dock, or raft for the party of the summer. Or take it with you on a microadventure. Because we don’t know much about how barrel saunas originated, we don’t know if the convection benefits of barrel saunas were intentional or unintended consequences. 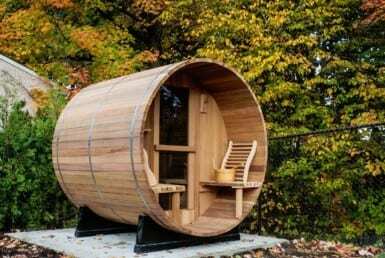 While saunas have been around for thousands of years, the barrel sauna was invented as recently as the 1980s. While the exact time and place may be lost in history, it appears to be a Canadian invention. Whatever the origin of the Barrel Sauna, Costco has played a major role in its adoption. 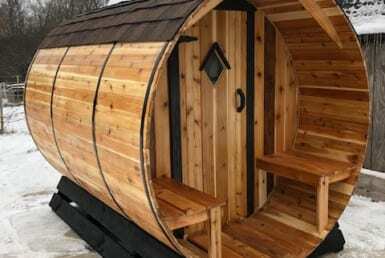 Between 2012 and 2018 they sold the Princeton 4-person barrel sauna and Seneca 6-person barrel Almost Heaven barrel sauna. In the $4,000 – $6,000 price range, these were bought almost impulsively by Costco shoppers. After a long run, Costco USA has stopped selling all outdoor saunas including Almost Heaven barrel saunas. Costco USA now offers only indoor, infrared sauna kits. Interestingly, Costco Canada is now offering Dundalk Barrel Saunas for $5,000-$6,700CA. While there are some good reasons to prefer a cabin-type outdoor sauna, a review of the reviews has not turned up a single regretful review. 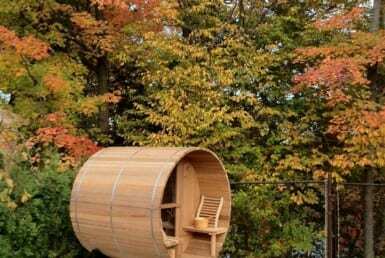 Some barrel sauna owners have boasted over 25 years of useful life from their barrel saunas. This is not surprising for a naturally durable wood like cedar with no ground contact and good ventilation. As previously mentioned, the lack of insulation causes concern that the sauna won’t get hot enough. Reading sauna reviews, it is clear that owners of wood-fired barrel saunas do not appear to have this problem. If an electric barrel sauna isn’t getting hot enough, either the electric stove is undersized or the barrel sauna needs thicker wood. 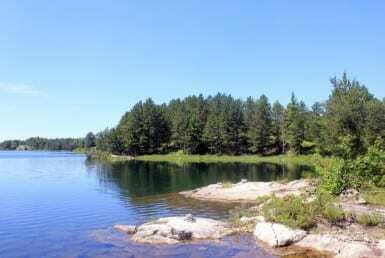 Barrel saunas are popular in Michigans Upper Penninsula, one of the coldest places in the Continental US. Rest assured Yoopers of Finnish heritage, would not be using saunas that didn’t perform. According to barrel sauna owners, they get plenty hot. The consensus of barrel sauna owners on Wood-burning Sauna Facebook page is that heat is not an issue, and some say barrel saunas are the hottest saunas they’ve ever experienced. 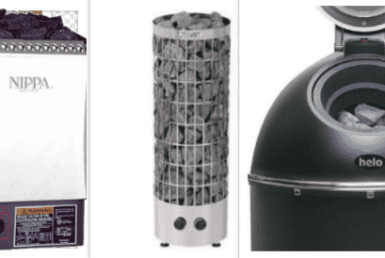 Many love that the steam cloud is heating and quickly moving thanks to the cylindrical shape of the barrel. The general review of barrel saunas by first-time skeptics who are used to traditional saunas is that they are surprised to achieve löyly, the traditional mark of a good, hot Finnish sauna. Some say that barrel saunas require more “tending of the stove” to keep the temperature up. One barrel sauna review said that without tending the stove the temperature can drop very quickly. This makes sense as barrel saunas have very little thermal mass. When designing your sauna, allow enough bench length to lay down. A 7+ ft sauna is ideal for 2 people and also works great for guests. Split wood into fine pieces to generate more heat. Build barrel sauna with wood of at least one inch thickness, ideally 5/4″ or more addresses most concerns with reaching high temperatures. In addition to keep the heat in, building your sauna with thicker staves means they will maintain their shape and last longer. Consider insulating the barrel sauna under the floor boards to prevent cold feet. Alternatively, you could lay down and put feet on the wall near the stove to really warm your toes. Add a changing room: a major complaint with barrel saunas is they can loose heat quickly when the door is closed. Most barrel sauna builders and barrel sauna kits have premium options with a changing room to prevent heat loss. This is especially recommended if you are having parties, renting your sauna, or having many people enter and exit. Consider shingling or other roofing: the ball and socket joints are designed to prevent leaking, but if your staves shrink after a few months of hot saunas, you may wish you were better protected. A roof on the top of your barrel sauna will also help keep the heat in and provide some extra insulation. Consider adding another layer between the barrel sauna and the roofing of reflectix bubble foil vapor barrier/insulation. Put fire brick on the bottom near the stove to make it last longer. Make sure their is absolutely no ground contact between the barrel wood and the ground. The stand can be replaced, but to get decades of use out of a barrel sauna, you must avoid ground contact with the barrel itself to avoid rot. If using a wood stove, make sure to use a damper and double walled vent through the chimney. Make sure your sauna isn’t a fire hazard. Follow local codes, clearances, and use fire bricks. Have a fire extinguisher handy. Make sure you’re starting on a solid ‘foundation.’ You need a firm and fairly flat surface, though a very slight might could help with drainage. Don’t put latex paint or other exterior finish that will seal it. Painting the exterior of a barrel sauna, though usually against manufacturers recommendations, is probably OK if you use a paint that allows moisture to escape. Plan plenty of time for preparing the project. From sourcing the wood to milling the joints and cutting. The prep work may take 2+ days while the assembly can be done in hours. Be picky when choosing wood. Make sure you’re not using warped or bowed materials. The fewer knots the better, source clear cedar if that’s in your budget. Use industrial tools if possible, especially the router. Prebuilt barrel saunas are generally custom delivered on trailers like this one, so shipping can be very expensive. If you want to save some money and there are not builders near you, you should look at barrel sauna kits or consider building from scratch. A common questions is, ‘Can I build a Barrel Sauna From Scratch’? The answer appears to be, yes – and cheap. 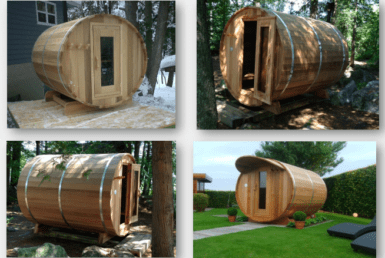 While there are no good barrel sauna guides or instructions that we can find, there is a youtube video of a loosely built barrel sauna that looks like a fun project. 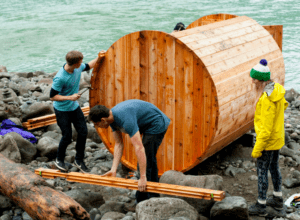 There’s also a blog showing an indoor barrel sauna from scratch being built in Whistler, BC. They used recycled windows, and even welded their own stove using propane tanks from a recycling plant. Building indoors makes it easier to heat heat up but you also need to make sure the area surrounding the sauna can handle additional moisture. Outdoor barrel saunas are usually a little leaky and will loose some humidity to the humidity. We do not recommend using indoor barrel saunas indoors. In both projects, the preparation of the 2×6 staves is the most labor intensive part, followed by building and cutting the circular walls. If these are not done properly, your sauna will leak. The staves really need to be cut perfectly. Barrel Sauna assembly after the walls and staves are prepared is fast, fun, and easy. For that reason, we recommend barrel sauna kits for most people, which still gives you some ‘sweat equity’. If you choose to go DIY, plan on at least two days of preparation and half day for assembly and only require basic tools you may already have. 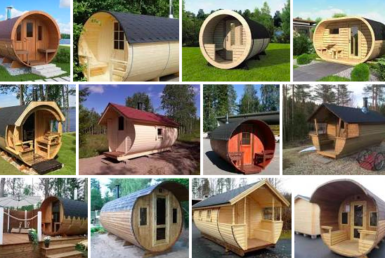 You can find barrel saunas for sale here, or by using our sauna search tool. If you can’t find what you’re looking for, contact us and we’ll help you find it.